Old Faithful... It's surprisingly hard to find a picture of the old reference guides online, so you get to see a scanned copy of mine! I didn't realize this until a few weeks ago, and it has since come in handy. While the jump from my trusty first edition to the second was mostly fixing typographical errors and website addresses, the latest October 2007 guide seems to have some more important changes. There are much needed clarifications from the CIR's and also additional exemplary performance options. This new book means more points! This does not mean that if you purchased a reference guide from an earlier version of the rating system (say... an NCv2.1 guide) that you automatically upgrade. 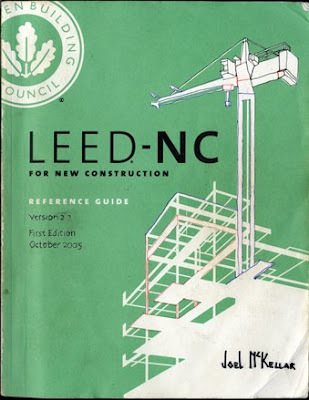 I'm going to guess that when LEED 2009 rolls into town I'm going to have to upgrade again, and am currently waiting for the new LEED-EB O&M edition to be released, so if you don't have a guide now you may want to consider waiting for those, or it's going to be a few hundred dollars right down the toilet. For those who could care less about digital updates and want to save some dough, you can find used copies for sale on ebay every once and awhile or on the AREforum more frequently. whatcha gunna do with all that LEED, all that LEED instead yo trunk?